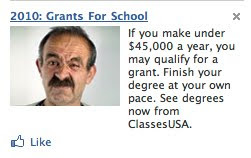 Here's another in an ongoing series of disjunctive ads that have appeared on Facebook. Does this guy look like he's going back to school for a degree? Looks more like he's stiffing a turd. For more suspect Facebook ads, check out constipation nation, Bin Laden insurance, pigman, and man-child.